I've been baking a lot recently, thanks to my go-to all purpose gluten free flour blend. It's been great trying out standard non-gluten baking recipes and using this blend as a substitute for all purpose flour. I was thrilled when I found this recipe on Melissa's blog because I missed having that simple pleasure of biting into a cinnamon roll. Now, it's possible! This recipe doesn't involve yeast and proofing or rising, unlike traditional cinnamon roll recipes. Instead, everything is made in a stand mixer and comes together quite quickly. The dough is rolled out immediately after a quick kneading with the dough hook attachment. Butter is spread on top and then a mixture of cinnamon, brown sugar and chopped pecans is sprinkled on. The dough is rolled up, cut into even pieces and then placed in a muffin tin to bake. Preheat oven to 375 and grease a 12-cup muffin tin. In the bowl of a stand mixer with the paddle attachment, combine the brown sugar, baking soda, salt, vanilla, and egg until one homogenous mixture. Add the buttermilk. Slowly add flour, mixing in one cup at a time, until a dough is formed. Switch to the dough hook attachment and knead for about 2 minutes. Roll the dough into a 12x24 inch rectangle and spread with softened butter. Combine the filling ingredients in a small bowl and sprinkle over the rolled and buttered dough. Roll the dough into a log beginning with the wide side. Stretch the log slightly. Cut into 12 two-inch pieces and place into greased muffin tin. Bake in preheated oven for about 20 minutes, or until golden brown. Allow the muffins to cool in pan for about 5 minutes, then remove from the muffin tins and drizzle with icing. Reheat in the microwave for 10 seconds if needed. 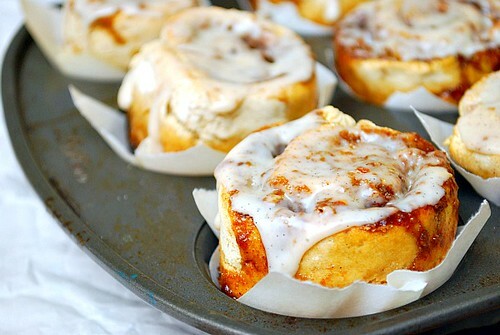 Great minds think alike, I posted overnight cinnamon rolls today. 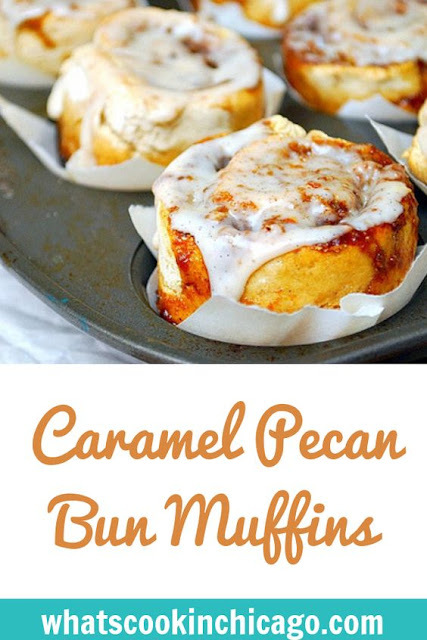 These look amazing and I am a huge fan of caramel so these are right up my alley! These look seriously amazing for being gluten-free. My eyes are rolling back on how much I want this right now...drool. YUM!!! OMG my mouth is watering! lol These look delicious! try adding some strong coffee and maple syrup to the glaze..oh yeah! I have a soft spot for pecans...I would love this with my morning cup of coffee. Yum! These would be great for Easter morning! Looks delicious! I can't believe these are GF! Way to go. Do you think you could make this a freezer recipe and if so how would you recommend doing so?